Another beer from a friend in New Hampshire. This one is from Big Sky Brewing in Montana and may be my first beer from that State. This beer is your standard every day IPA in a 12 oz can. Appearance is quite nice with a color that almost matches the can and thick off white head. Aroma is minimal with some tropical and piney hops but not a lot happening. Taste leans more towards the pine/resin than the tropical hops and again is OK but nothing too memorable. Fairly bitter finish and lingering aftertaste bring this down a notch for me. Overall not a bad beer and something that could be an every day beer for a lot of people. I am sure in Montana this beer is fairly inexpensive and readily available. 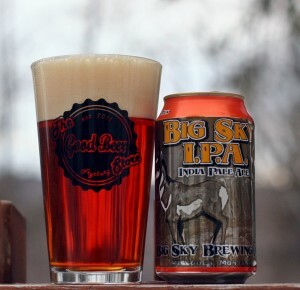 Brewers Description: In Montana, many classic memories are made right after someone says “hold my beer and watch this.” These bold assertive moments deserve a bold and assertive beer – Big Sky I.P.A. – Distinct hop presence and malty backbone will leave you refreshed and ready for your moment of glory. So hang on tight & enjoy the ride!